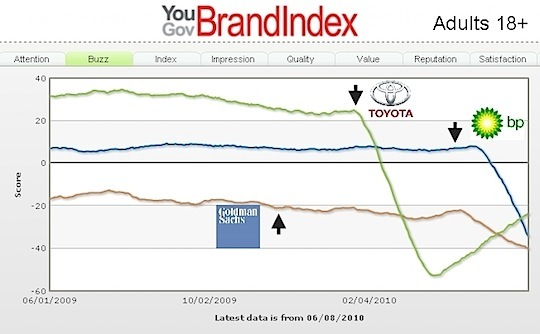 Via Felix Salmon, this chart from BrandIndex shows the changing fortunes of three global companies that have fallen on hard times lately. The score comes from responses to the question “If you’ve heard anything about the brand in the last two weeks, was it positive or negative?” BP is still lagging a bit behind long-term champ Goldman Sachs, but they’re catching up fast. Give it another few days and they should be the least popular brand in the world.